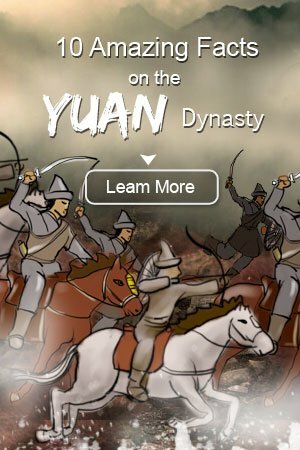 Learn about the Yuan Dynasty, the largest empire in China&apos;s history: its origin, Mongol emperors, achievements, and end. See our Yuan Dynasty map. The Yuan Dynasty (1279–1368) was China&apos;s first foreign-led dynasty, in between the Chinese Song and Ming dynasties. 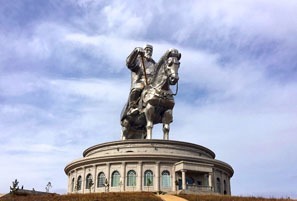 It was established by Kublai Khan, leader of the vast Mongol Empire, and fell into internal rebellion after it lost touch with its Mongol roots. The Yuan empire was founded by an illiterate nomad named Genghis Khan. The Yuan Dynasty, ruled by Kublai from 1279, was the first foreign-led dynasty in ancient China. Kublai&apos;s empire was the first to use paper money as the main currency. The traditional Han ethnic people stayed at the bottom among the four-class system during the reign of the Mongols. The famous Italian traveler, Marco Polo, visited China during the Yuan Dynasty and introduced China to Europeans. Trade on the Silk Road trade routes through the Hexi Corridor enriched the Mongol rulers and gave them power. Their control of this land passage allowed their troops to quickly move east or west as conflicts arose. Genghis Khan died in 1227 and had named his son, Ogedei, to be the next emperor. Ogedei was said to rule the whole Mongol empire from 1229 to 1241, but he concentrated his efforts in the eastern part of it. In 1232, he invaded the Jin empire in alliance with the Song empire. Jin was defeated in 1234. From 1235, Ogedei started a campaign with the Song Dynasty. However, another brother of Kublai Khan who ruled the Ilkhanate far in the west paid homage to Kublai, but he was essentially independent of him. Kublai lost his direct control of these big Mongol regions in the west. Hence, the eastern part of the empire became a base of power in the year 1260. 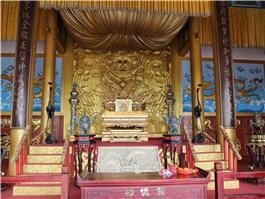 To rule his empire, he utilized the government structure he found established in the Jin and Song empires but he replaced the officials with foreigners. The Yuan Dynasty came from Mongolia. In 1266, Kublai made Dadu (modern-day Beijing) his capital, and this further alienated him from his Mongol kinsmen who claimed he didn&apos;t follow Mongol ways and wasn&apos;t loyal to the Mongols. In 1271, Kublai Khan founded the Yuan Dynasty, which coexisted with the Southern Song Dynasty. In 1273, Kublai Khan issued paper banknotes called chao (钞). This was a big innovation in the banking and monetary system. Paper currency had been issued and used during the Song Dynasty era but the Yuan empire was the first dynasty in the world to use paper currency as the predominant circulating medium. The advantage of paper money was that a large sum of coins was more difficult to carry and use. For a while, paper currency helped increase the empire&apos;s trade with the rest of the world and increased the empire&apos;s overall wealth. In 1274, he sent between 800 and 900 ships to conquer Japan for the first time. Then a storm destroyed several hundred boats. In 1279, the Mongols completely conquered the Southern Song in the naval battle of Yashan. The last emperor of Song, the 8-year-old Emperor Bing, drowned himself in the sea with a loyal minister. The Song Dynasty collapsed. Kublai eventually had real control of northern and southern China. He was known as Emperor Shizu of Yuan. In 1280, 6 years after Kublai&apos;s first campaign against Japan, he ordered the hasty assembly of a very large force. It is thought that one fleet was composed of 900 ships and that another was composed of 3,500 ships. The second fleet is said to have carried 100,000 men. When the main fleet landed, they faced a wall that the Japanese had constructed against them, and they couldn&apos;t advance past the beach. Then a typhoon destroyed the rest of the fleet. It is thought that the ships the Mongols sailed in were designed for rivers and were not suited for sea voyages. 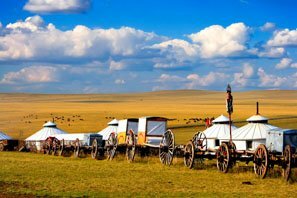 The Mongols, though they were originally nomads, herders, and hunters, ruled the empire successfully in the first few decades. This amazing dynasty made some major changes in the region&apos;s government and culture. 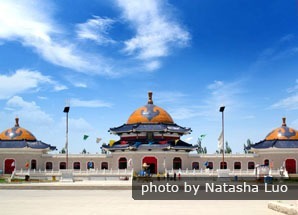 One big change during Kublai&apos;s reign was that foreigners became the rulers and administrators. Since they didn&apos;t trust the local people, they moved in a large number of Muslims and other people to help them rule the empire. The Mongols had their own religious belief called Shamanism. However, this religion did not spread. Instead, both the Mongols and some indigenous people started accepting Islam. Some of the western Mongol domains converted to Islam, as did many Mongols in Central Asia and China. They established a class structure with Genghis Khan&apos;s clan at the top, Mongols next, Muslims and other foreigners who were installed in official positions next, and the Chinese at the bottom. This created a lot of resentment among many of the people. They exacted a lot of wealth from many tributary states,which they used to fund their wars and to live extravagantly. 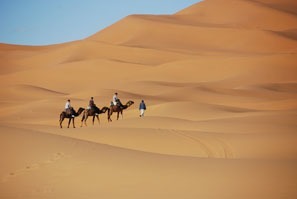 Muslim administrators and merchants took local wives and brought up their descendants as Muslims. In this way, Islam was established as a minority religion. In the beginning, the Mongols didn&apos;t emphasize and nurture the old Chinese literature, philosophy, or culture. They were more pragmatic. They wanted to have fun, and so they liked theatrical entertainment with a lot of action and Mongol-style music, big feasts, and parties. Mongol rule was the time for popular entertainment to flower in the colloquial language for both the rulers and the masses. In the genres of fictional novels and theater, major works in the vernacular language were written. The Chinese resented the Mongol proscription against them holding important positions as officials but the empire held together well until the third emperor, named Kulug Khan, came to power. His reign lasted only a few years from 1307 to 1311 but the empire had a severe debt and inflation problem, and discontent grew. During his reign, the value of the paper currency was devalued by about 80 percent. This procedure enriched the court and the Mongols relative to the rest of the population but impoverished the population in general, especially the rich Chinese merchants and officials. Since the Mongol rulers could print as much paper currency as they wanted, they printed too much and the value of the money kept dropping. The costly wars and great defeats were financed largely with paper money and, to reinforce their monetary control, they outlawed the use of gold and silver currency. From the 1330s onward, natural disasters, such as epidemics, droughts, and floods, brought suffering and death to the peasants. The Little Ice Age began, and similar famines and natural disasters caused political instability around the world at the same time. In 1331, the bubonic plague pandemic, known as the "Black Death" in Europe, began to sweep the empire. The epidemic ravaged the empire. Millions of people died in Hebei Province alone. In 1344, the Yellow River shifted course. This caused a massive flood that impoverished an important and populous region at the center of the empire. The river flooded on two other occasions during the last couple of decades. There were also massive famines. There was a time of drought that lasted from 1340 to 1380. In 1351, a rebellion started called the Red Turban Rebellion. The Red Turbans said that the bad rule of the Yuan Dynasty caused the natural disasters because they lost the Mandate of Heaven. The court defeated the rebellion but more started soon after. Between 1356 and 1367, an important leader of the Red Turban Rebellion, Zhu Yuanzhang, defeated all the other powerful rival armies. In 1368, he attacked the Yuan empire capital of Dadu (Beijing) and gained control of it. The Yuan court fled northwards. Mongolia became the final home of the Yuan Dynasty clans. Mongolians kept trying to recapture the empire but they failed. They eventually allied with the Manchus, and Mongolians became officials in the Qing Dynasty. Zhu Yuanzhang destroyed the Yuan palaces. He established a new dynasty called the Ming Dynasty. The Silk Road was a part of the Mongol and Yuan empires. 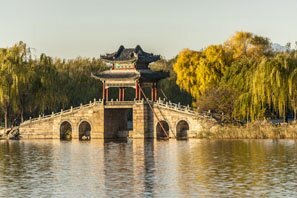 Beijing tours: Beijing (then called Dadu —&apos;Big Capital&apos;) was the capital of the Yuan Dynasty and has continued to be China&apos;s capital for most of the following 800 years. 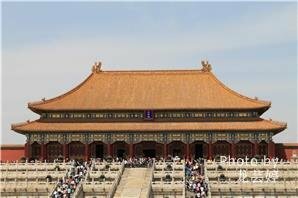 Discover the enduring charm of the &apos;big capital&apos; with China Highlights. 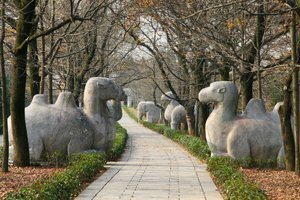 Silk Road tours: Their control of the Silk Road&apos;s northern land route to Central Asia gave the Mongols a major source of income and manpower. It is still a popular travel route for sightseeing. We offer a number of packages that highlight the sights along the historic land route.